The Location of Graham-Newman LLC Hawaiian Gardens is on E Carson St at Norwalk Blvd in the heart of the shopping plaza. Long Beach Transit’s bus line #173 has a stop at Norwalk & Carson NE, right in front of this location. Check their website for more info about routes. This Graham-Newman LLC Hawaiian Gardens is located near Jack in the Box, Peris, and is next door to CVS. LoanMart has Auto Title Loans in Hawaiian Gardens! If you have poor credit, and have run into financial difficulty, enter LoanMart. LoanMart has helped thousands of customers with poor credit receive often up to $30,000 in financial assistance since opening doors in 2002. LoanMart is less concerned with your credit rating and more interested in your income, your ability to make monthly payments, and your vehicle’s equity. Find out more details below about auto title loans below. All Credit Types Welcome and it is completely free to apply for an auto title loan in Hawaiian Gardens. There is no obligation to continue with your loan if you do qualify. The way LoanMart sees it, everyone deserves the chance to make an educated decision. Come make yours. Fill out and submit the information request form on this page and wait for a call from an agent. Click Chat Now for an instant connection with a representative. Call toll-free to speak directly with a LoanMart agent. 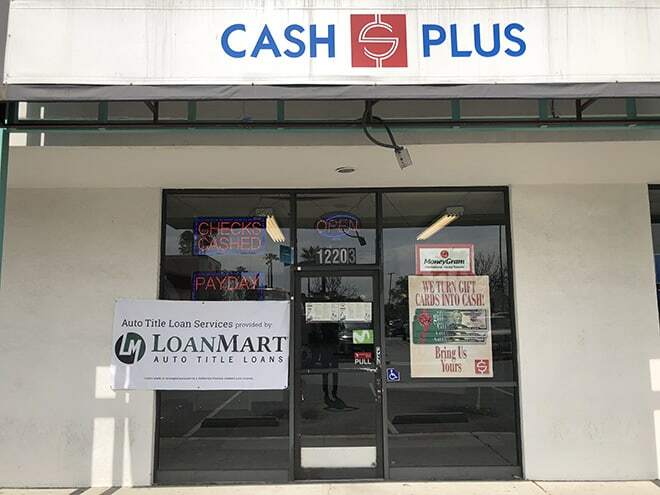 Once approved, your LoanMart agent will talk to you about how to get your auto title loan check, via LoanMart and Graham-Newman LLC Hawaiian Gardens.